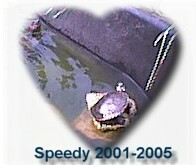 Sorry about Speedy, he was lucky to have you as his Mom. What makes you think she wasn't well cared for? Please think through your comments before you post, or don't post at all.